That was an election we’ll be talking about for a long time. A big thank you to everyone who participated by voting, registering voters, knocking on doors, making phone calls, donating, asking a question during a town hall or debate or getting other people involved. Before I share my thoughts with you about the election, its impact on the movement, and what the election means for our democracy, I have a special ask for you: please call your representatives, whether they are staying or leaving, and thank them for their service. Whether you agreed with your elected official or not isn’t the point. I’ve got to know a lot of elected officials at every level of government and the overwhelming majority of them get into political life for the right reasons: they want to improve the lives of their constituents and their fellow citizens. When you call them, it’s ok to say you don’t agree with them. But please let them know you are Secular Values Voter, thank them for their service and you are looking forward to working with them in or out of our government. Secular voters showed up! 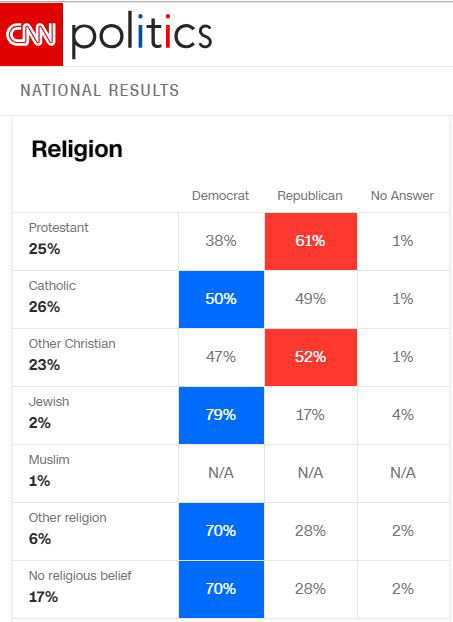 Exit poll data indicates that turnout among nonreligious voters was up two points from the 2016 election and up five points from the 2014 midterms. In total, nonreligious voters accounted for 17% of the electorate on Tuesday. Evangelicals overperformed. White evangelical christians make up only 15% of the population, but comprised more than one-quarter (26%) of the midterm electorate. Their outsized influence is due, at least in part, to the massive sums of money they spend on their get-out-the-vote initiatives. 2019 will be the Year of the Freethinker. Our friends at the Freethought Equality PAC announced a record 47 victories including Megan Hunt (NE – State Senate – Atheist), Jon Rosenthal (TX – Representative – Agnostic), Jacqueline Chretien (NH – Representative – Humanist), Howard Watts (NV – Representative – Agnostic). This is really important because the separation of church and state is front and center, and secular legislators aren’t going to trade on it. Elections Matter: A Democratic majority in the House means the Johnson Amendment is alive; First Amendment Defense Acts are dead; and poison pill amendments in the budgeting process, like the Aderholt Amendment, are done. Who You Elect Matters: Secular Coalition For America ally, Congressman Jerry Nadler (NY) is likely to become chair of the House Judiciary Committee. His committee will be able to hold the Department of Justice accountable for its role in creating the Religious Liberty Task Force and enabling the rest of the federal government to implement broad religious exemptions. Congressional Freethought Caucus Members Will Grow in Prominence: Caucus members are likely to assume key committee roles including Zoe Lofgren (CA) as chair of the House Administration Committee; Jamie Raskin (MD) as vice chair of the Judiciary Committee; Jared Huffman (CA) as vice chair of the Natural Resources Committee; and Dan Kildee as vice chair of the Financial Services Committee. More Religiously Unaffiliated Members are Coming to Congress: According to CQ, there will be 7 new religiously unaffiliated members of Congress: Sean Casten (IL), Sharice Davids (KS), Tom Malinowski (NJ), Antonio Delgado (NY), Katie Hill (CA), Chrissy Houlahan (PA), and Jennifer Wexton (VA). We Can Advance Legislation: Expect legislation such as the Do No Harm Act to start to move through Congress. Although we don’t expect this type of legislation to get to the president’s desk, we can expect it to spark an important congressional debate on the abuses of the Religious Freedom Restoration Act and the importance of ensuring that religion is never used as a license to discriminate. Courts Will Continue Their Conservative Trajectory. A more conservative Senate will continue to approve socially conservative judges. There are now 870 federal judges in total and 124 vacancies. We expect that the President will be able to fill the majority of these vacancies during the next two years. Religious Liberty Will Keep Being Used as a Wedge Issue: An Arizona measure a voucher scheme was defeated. We want to give a shout out to the Secular Coalition for Arizona for their tremendous work, as well as to openly nontheist lawmakers, Arizona State Senator Juan Mendez and Arizona State Representative Athena Salman. Yet trigger laws banning abortion in Alabama and West Virginia won as did another ballot measure in Alabama to allow 10 Commandments displays on public property. More Rules Will Be Coming: The Administration is getting much more adept at pushing through rules and regulations that expand religious exemptions. We will be working with Congressional Freethought Caucus Members to hold the departments accountable who are promulgating these regulations. On the whole, the secular movement is in a much better place today than we were last week. Finally, we are reviewing our legislative options and priorities for the next congress in conjunction with the Congressional Freethought Caucus. You will receive a more formal survey in the next few weeks to participate. In the meantime, if you do have some ideas, please send them to me at [email protected] I might not be able to implement your ideas, but I do appreciate hearing from you and letting me know your thoughts. Thank you for your hard work standing up our secular values. I am looking forward to standing with you and keeping the pressure on!